Raichur, a city situated between the Krishna and Tungabhadra rivers, is located 409 kilometres from the capital of Karnataka, Bengaluru. The city that has an attachment to history and culture that goes back to the days of Emperor Ashoka. The name Raichur, originally Rayachooru, means a king’s place in Kannada. The word “Raya” means king whilst “oor” means place or town. There is another theory behind the name. Raichur is said to have originated from Telugu words “Rai” meaning stone and “ooro” meaning town, combined to Raichooro, a town of stones. Raichur has been a part of various dynasties like Chalukyas, Mauryans, Bahmanis, Mughals and Vijayanagar, and therefore bears the legacy of a rich and dynamic history. This battle between Bijapur and Vijayanagar is historic for more than the obvious reason. It is also historic because European, or rather Portuguese and Turkish artillery were used for the first time on the Indian mainland. Due to its rich cultural and historical heritage, Raichur is a favourite destination for many tourists, both local and international. It is the most popular attraction of the city. The fort was built by the Kakatiya rulers in 1294 AD. The three sides of the fort are surrounded by double rows of massive low circuit walls, which are built on a hill 88m high. Its inner wall was constructed using big blocks of stones that are blocked together without any binding material between them. The main attraction, however, is a 41 ft long stone slab. It carries records in Telugu with a scene whereby huge slabs are hauled up a hill with the help of buffalo carts. One more reason for the fort being so popular is the stone inscriptions in Persian and Arabic language. These inscriptions are said to belong to Ali Burj. You can see ruins of ancient temples and several tanks on the premises. The name of the temple has been connected to a great devotee of Lord Shiva, Maharishi Markandeya. The Markandeshwara Temple is situated in Kallur 21 kms from the city of Raichur. One of the oldest shrines of the city, the temple is the home of Lord Shiva, and his idol is present here in the form of Markandeshwara. The temple is a very prominent attraction due to its beautifully carved pillars. The villages and the hills around the area are surrounded by other historical monuments. A significant mosque, built in a Persian style, is situated in Raichur city. 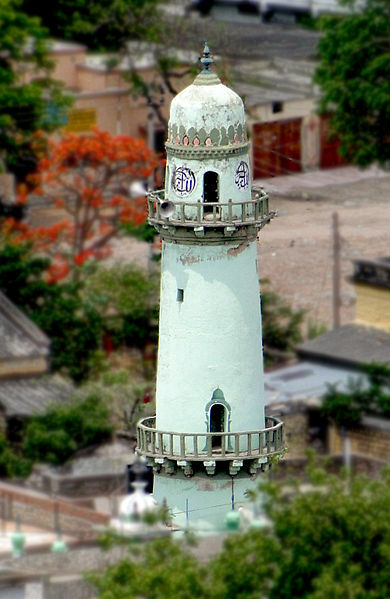 It comprises of a two-storied 20 m high minaret. One can enjoy the panoramic view of the city by getting on the top through the winding staircases leading you directly to the top of the mosque. Built during the Adil Shahi dynasty, it is one of the most beautiful and biggest mosques, with two entrances and six gigantic pillars. At this masjid, there is a cemetery belonging to the Adil Shahi dynasty, with several remains of an ancient palace and fort. Situated 23 km north of Raichur city, is an island is associated with Lord Krishna, which makes it a popular religious site. People also believed that Lord Rama stayed on this island for about a year during which he consecrated and worshipped a Shiva lingam. The Veerashaiva Matha are also said to reside in Ramagadde. They are a religious sect that worships Lord Shiva and to do not believe in the Hindu caste system. Aam Talab is a historic tank, also known as “Mavinakere”. A very popular tourist venue, the Aam Talab has tourists thronging by the thousands to take a ride in the boats. It is a popular local picnic spot and is usually heaving on Sundays. Raichur is well connected to several major cities like Mangalore, Mysore and Bengaluru via road and rail. The nearest airport is Rajiv Gandhi International Airport in Hyderabad, which is 183km from the city. Hubli Airport in Hubli is 256km away. Bangalore International Airport is around 434 kms from the town. The town is accessible by bus and taxies. From the state capital Bengaluru, Raichur is 409 km by car. Regular buses from all major cities pass through Raichur Bus Station. Mysore lays 514 kms away from the place. The nearest railway station is Raichur RC on the Guntakal-Gulbarga railway line, and trains from all major cities pass through this station. It is important to plan your journey, well in advance to avoid last minute hiccups. Raichur, nicknamed “The Golden City” is a must for anyone who visits Karnataka. Absorb the cultural and historical atmosphere of this legendary city.